The "Dashboards" area of the ConceptDraw Solution Park is a collection of basic types of Visual Dashboards. The Time Series Dashboard solution can be used to create the interactive Time Series Charts as Column Charts, Line Charts, or Bar Charts for your interactive dashboard. You can easily create a visual interactive dashboard using charts and graphic indicators from Live Objects libraries. Then you can connect the Live Objects with data source files to visualize the actual values of your performance metrics. For example let's create an interactive chart to monitor visually the sales performance. Open the Time Series Charts library and drag the proper chart object from the library to a document page. Find out the Time Series Dashboard solution and double-click a sample data source TXT file preview. You can use this sample file to assign your specific data to the live object. Edit the data source TXT file according to your particular data and save it. Open Action menu of the Chart object, using the button in the upper right corner of the object, then choose Select Data Source and select your saved data source file. The Live Object will change its appearance because it displays the actual data from your source file. Result: Now your chart shows the actual data from the data source files. The Live Objects will refresh the data every 5 seconds. So as the data updates in the data source files, the Live Object shows the new data every 5 seconds. 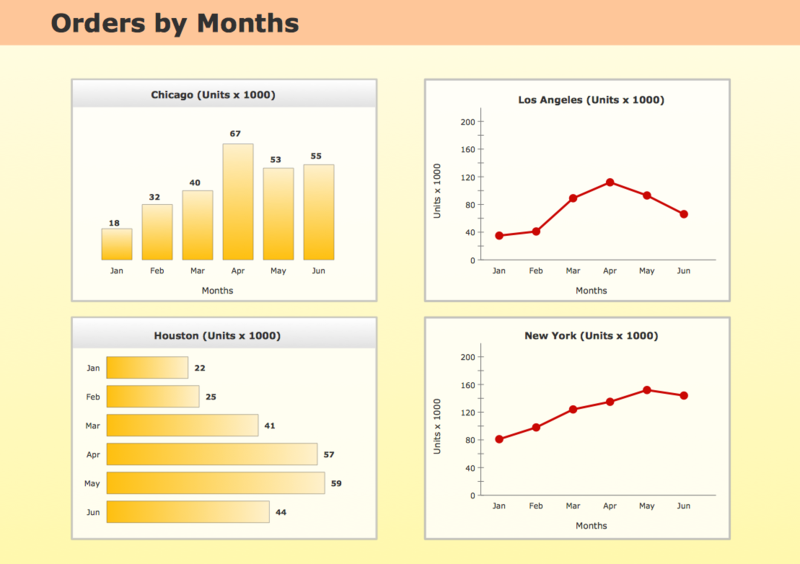 Interactive Time Series Charts: Column Charts, Line Charts and Bar Charts.